The WMUNC webpage has a lending library for Bible study materials that will be loaned to churches. Visit http://media.wix.com/ugd/4f59ca_d230782c1206444cb3d43b875d6ea7f5.pdf for the listing and visit http://www.wmunc.org/#!bible-studies/c1j8k for the information on how to borrow and return these studies. 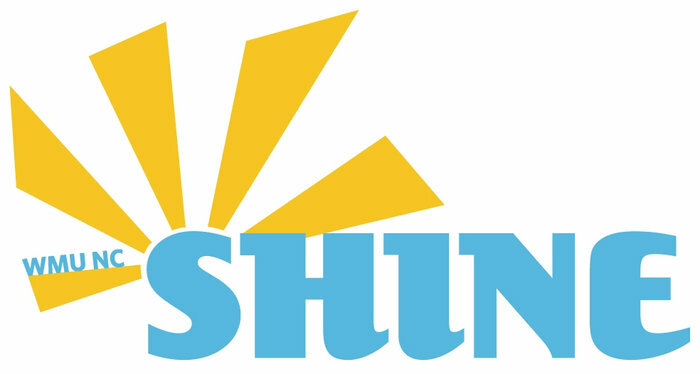 SHINE: myMISSION NC is a statewide group of young women (ages 18-35) that seeks to challenge, inspire, and teach young women to be God's light in this world. SHINE: myMISSION NC is a cross between a small group Bible study, prayer group, and missions organization. Members of the group vary in age and stage of life but come together online or at SHINE events for mission projects, social transformation, discipleship, fellowship, and encouragement. Are you registered yet for Missions Extravaganza? We hope so! If not, what are you waiting for? Register today! We would love to see you there. Join us at a "Quarterly Leadership Luncheon". A time and a space to encourage, inspire, and renew leaders. It’s a place to fellowship and network with other leaders around the Raleigh/Cary area, and grow in your own leadership skills. and fellowship time, and time for lunch. lunch and all workshop materials. Luncheons are hosted at the WMU NC office.